The Western Australian town of Northam is in the heart of the state’s wheat-belt, with the staple crop the backbone of the town’s economy. In fact, Northam is the largest Western Australian inland town, not founded on mining. 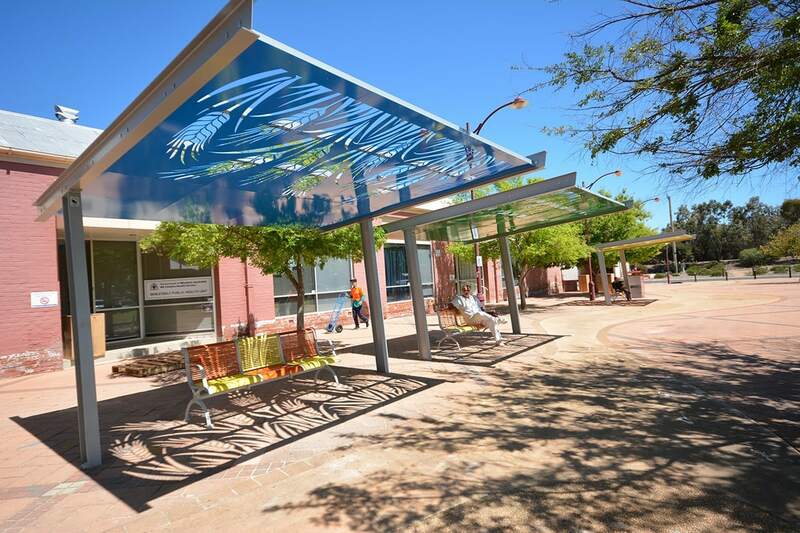 With average summer temperatures in the mid-30s, the local shire council identified a need to supply public shelters outside the town’s biggest shopping centre, Avon Central Mall, in conjunction with its upgrade. In a fitting tribute, it was decided that the design of the new public amenities should be inspired by wheat. Landmark Products and UDLA worked together to provide three iconic shelter structures to shade outdoor seating which had already been installed in the Mall. 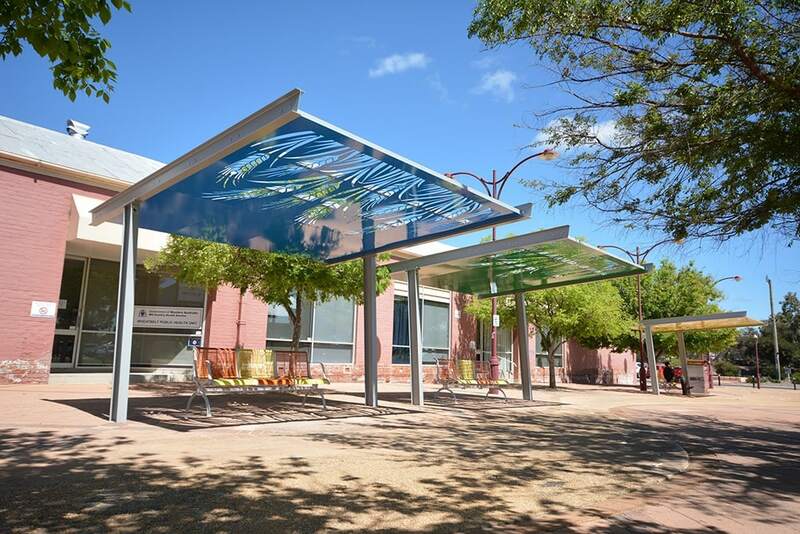 Landmark designed, manufactured and installed three modified King Series cantilever shelters to create a simple and vibrant urban aesthetic streetscape, which is already encouraging greater use of the area. Manufactured from hot-dipped galvanised steel, the roof frames and posts provide a strong foundation and durable protection against the local environment. Each shelter measures four-by-four metres (4mx4m), with roof sheets featuring aluminium artwork panels fixed to the underside of the purlins for a clean aesthetic. During the day, the “wheat-inspired” artwork creates an intriguing shade pattern onto the ground. The roofing is appropriately branded in the colours of the Shire of Northam, using Blaze Blue, Mistletoe and Lemon Yellow powder coating colours for the finish. The shelters were delivered in flat-pack kit form and were carefully installed below-ground to protect the existing pavement. Representatives of the Shire of Northam were very satisfied with the design outcome of the shelters considering budget availability. 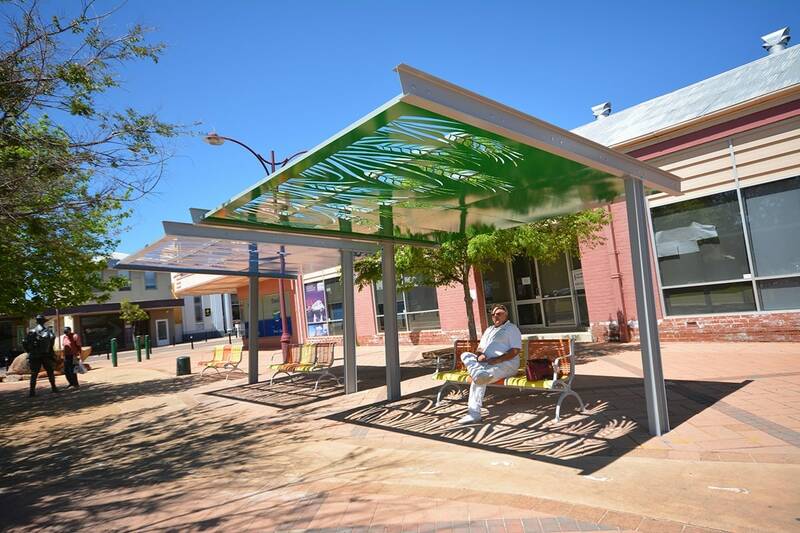 Northam residents and visitors are now able to enjoy these vibrant shelters at Avon Mall.